Nothing fancy today, but a nice addition to the Stillburg undead. These are two of the good old Kev Adams C18 Zombies. Some of the finest zombies ever made, if you ask me. 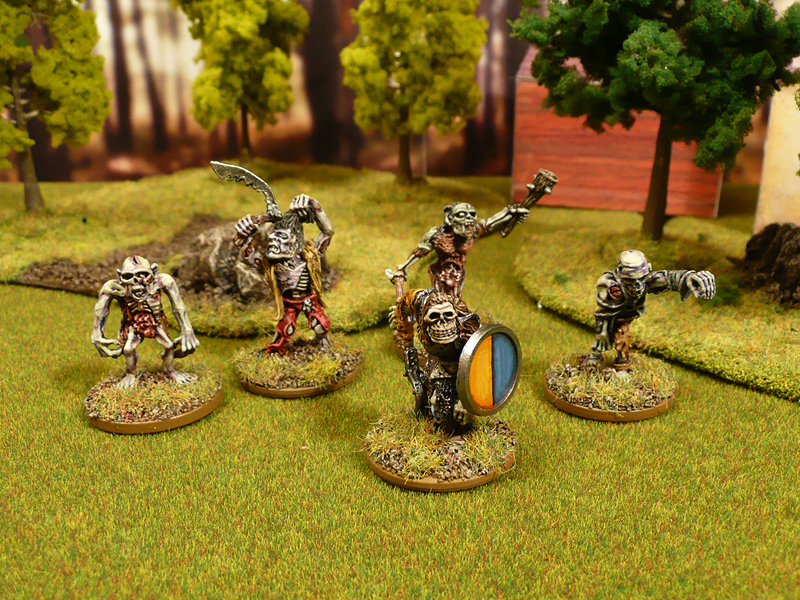 The whole happy gang of undead shufflers. It’s not obvious that the lieutenant actually is a zombie due to his exposed skull but I’m sure we’ll manage. His posture is that of a zombie rather than a skeleton warrior. 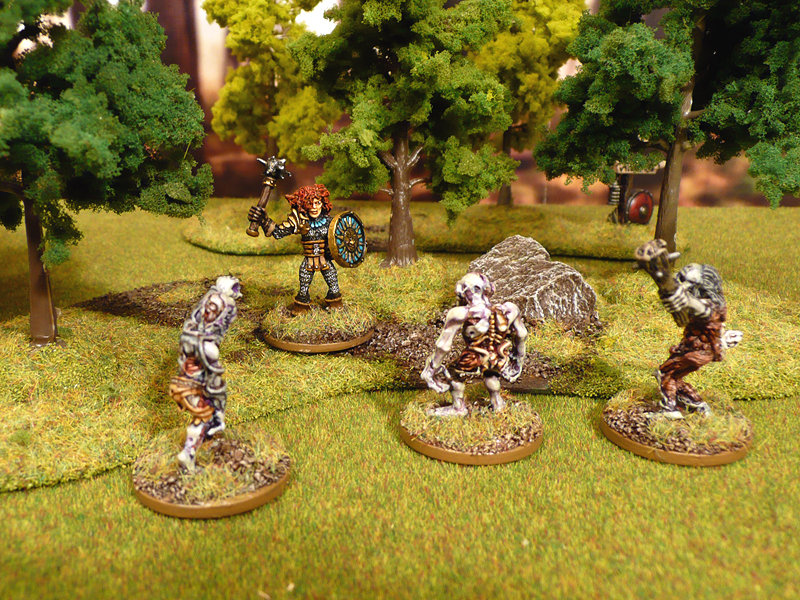 For the next Stillburg scenario, a new troop type will be used; Zombie Lieutenant. They’re basically a low powered leader type used to allow zombies group moves. I’ve been thinking about how to represent the lieutenants and how to differentiate them from their mindless brethren. First plan was to use armoured zombies with a shield. 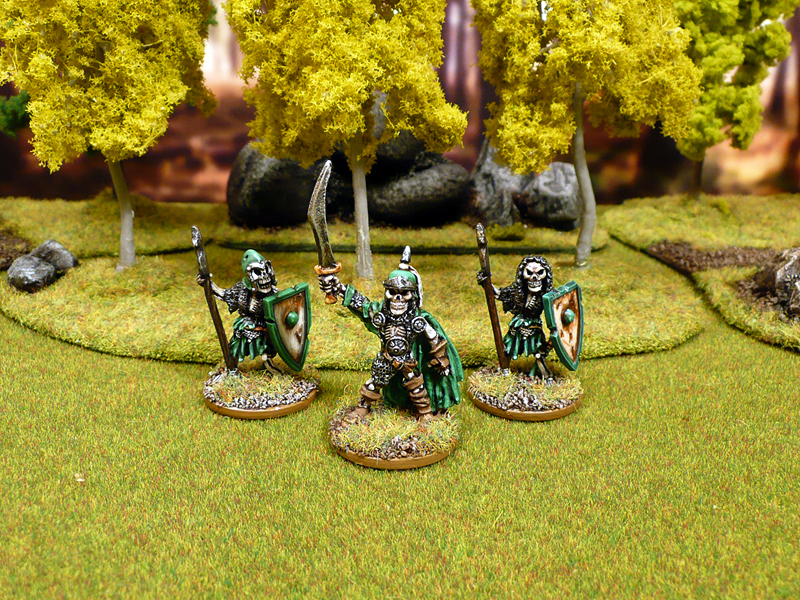 Unfortunately, there are only two vintage Citadel zombies that have any armour to speak of, and I will need at least three. There are two candidates which could work; 074579/20 (center in the bottom row) and 074579/16 (right most in the bottom row). 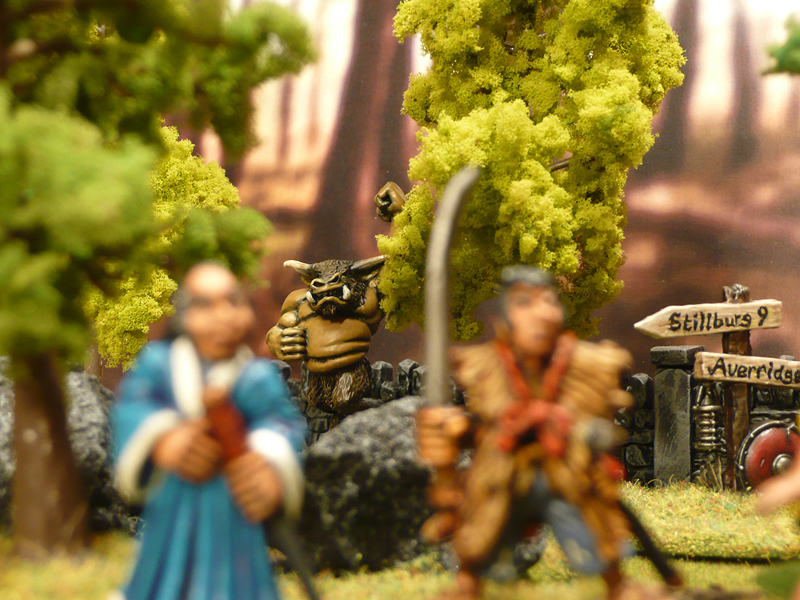 If anyone have either of them (would prefer the guy with the sword) – please let me know! 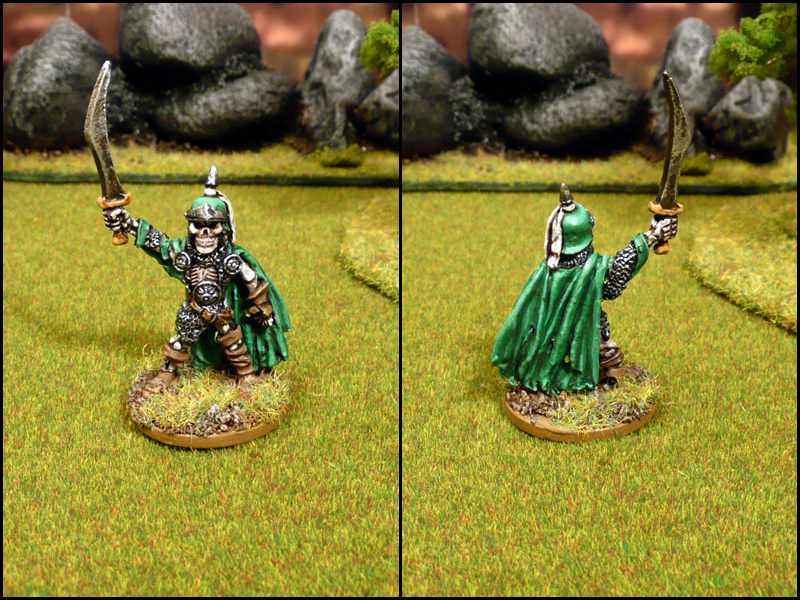 I’ve also finished up one of the militia men from scenario 1. 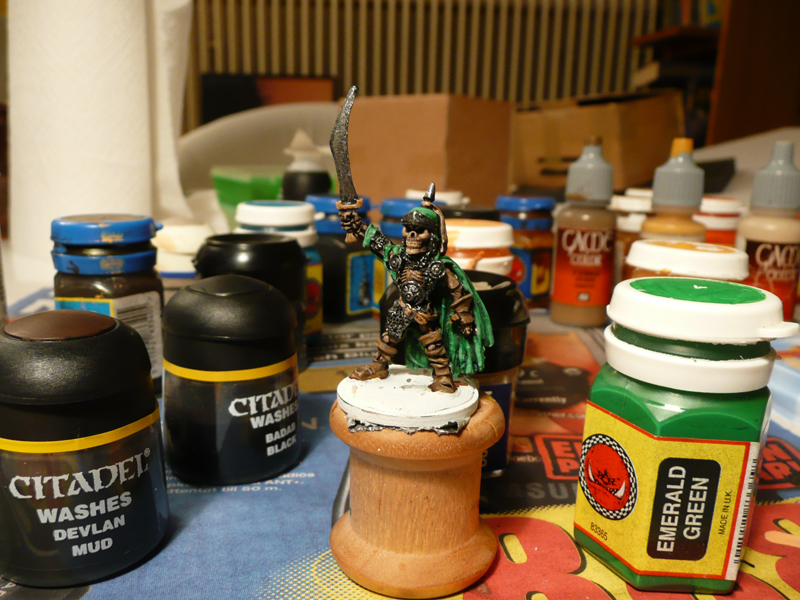 It’s a bit of a quick rush-job, partly because I had to get him on the table quickly – but also because of him not being a Citadel miniature. 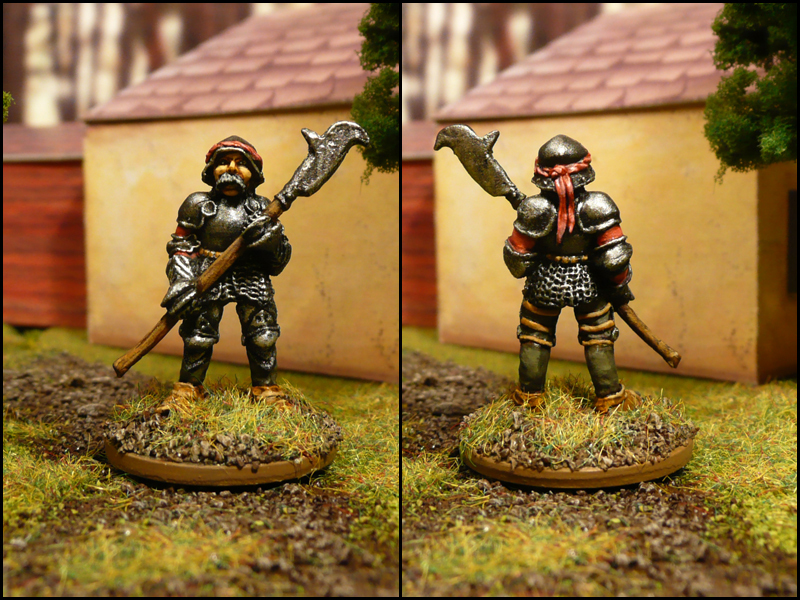 It’s an old Metal Magic paladin, currently available from Mega Miniatures as a Guard Holding Halberd. He’s normally acting as a name-less, disposable red-shirt kind of ally but could also work as a guard captain when one is needed. 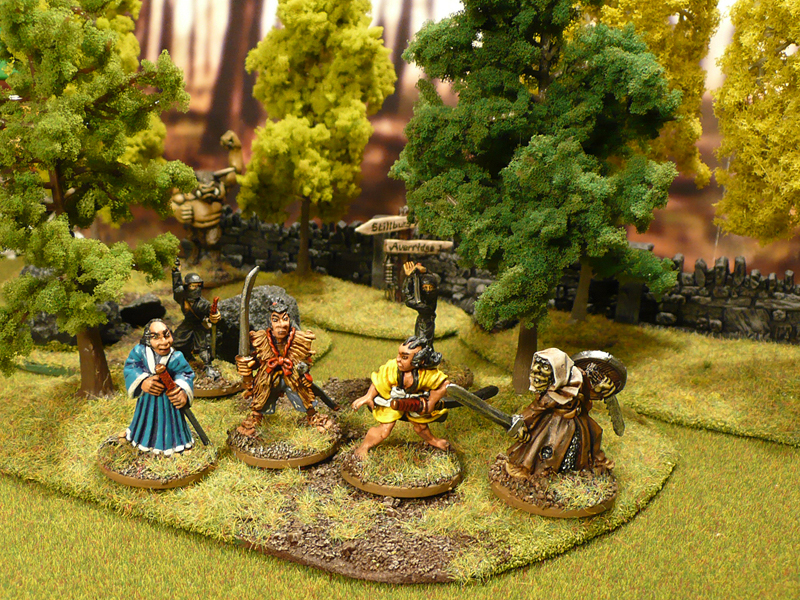 I’d like to recommend Mega Miniatures, as their minis and shipping are VERY cheap ($1.43 per miniature, and a few dollars for international shipping) while reasonably nice looking. When I ordered from them, I got the minis delivered from the US to Sweden in a matter of days. There are some issues with the scale between ranges though… the Metal Magic minis are usually fine next to old Citadel sculpts (but some will look a bit small). 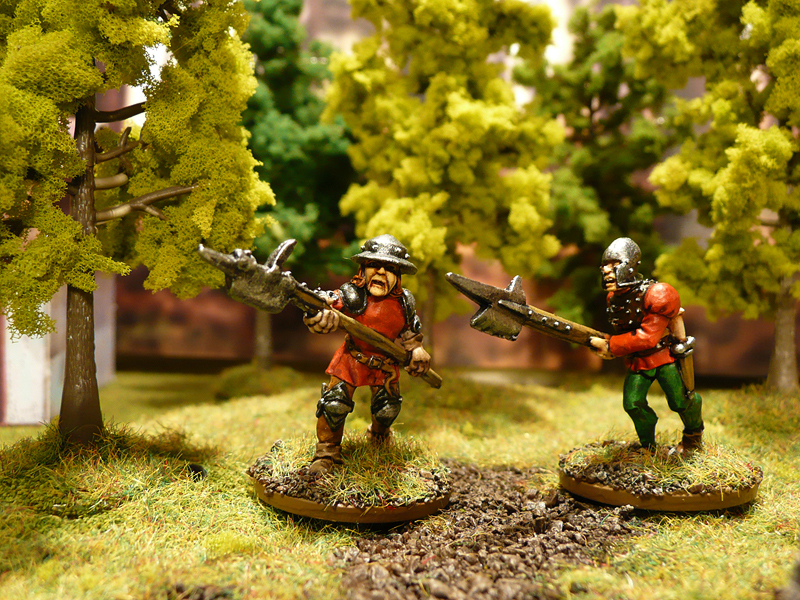 The old Grenadier line also sold by Mega is basically 25mm scale and much too small to mix with Citadel. 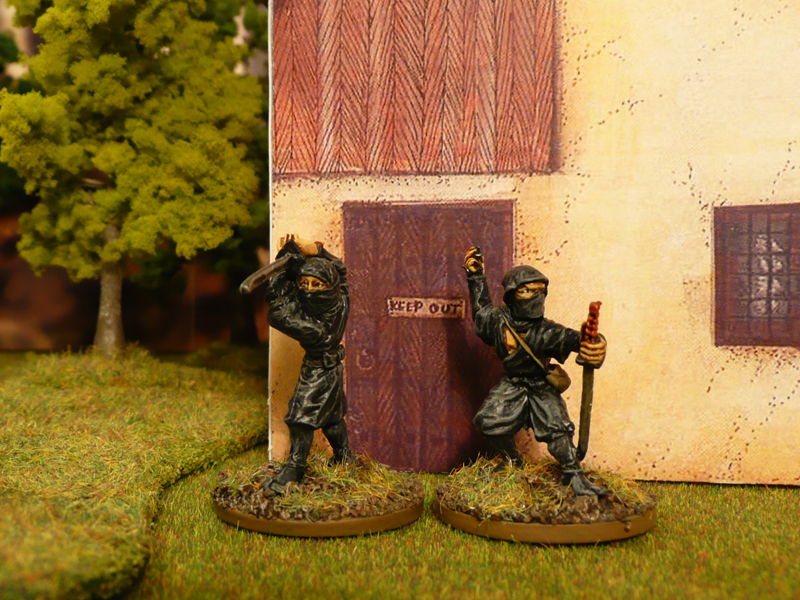 Coming up next… Ral Partha ninjas!? 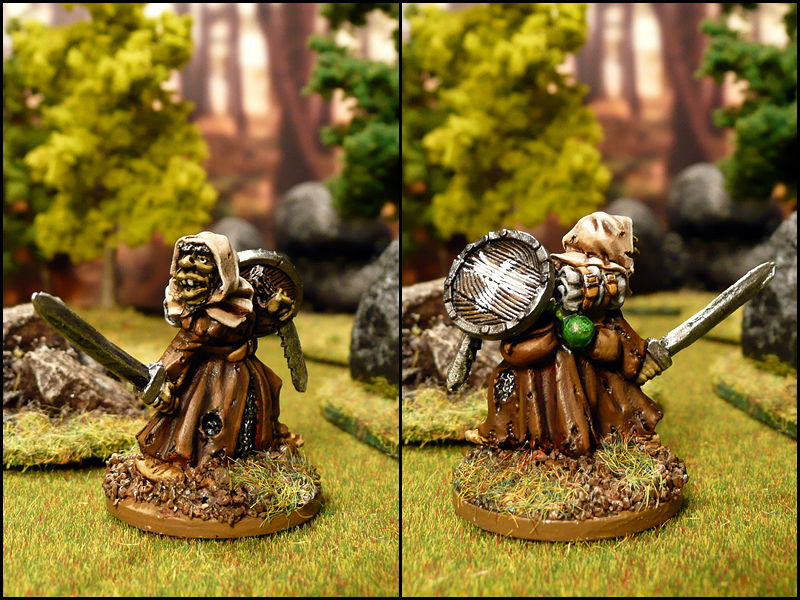 Finished painting a mini for the undead forces of the next Stillburg scenario. It’s Mordini; the commander of the old Regiment of Renown Nightmare Legion. Not sure that will be his name in Stillburg, but as I think “Mordini” every time I see him I’m pretty sure I’ll use the name. He’ll serve as a skeleton captain (skeleton warrior with Leader trait). 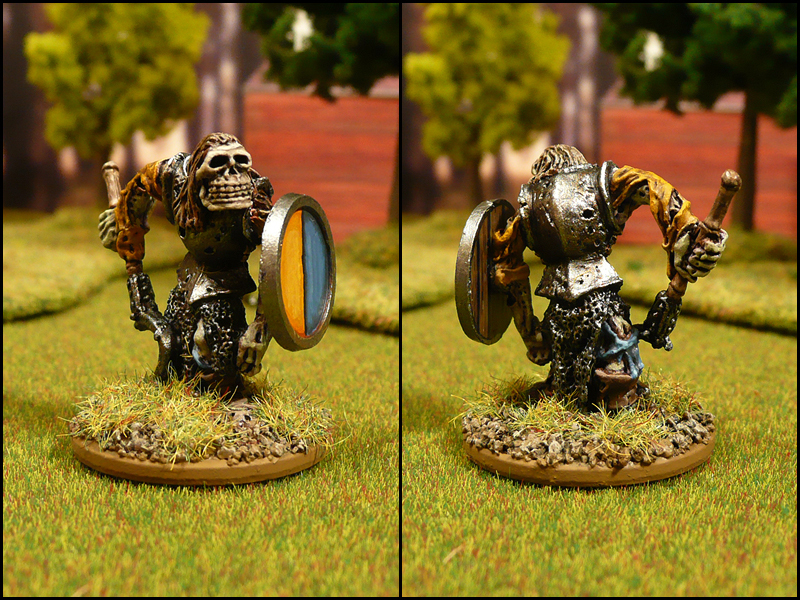 He’s one of the first minis I acquired in my return to Citadel miniatures this spring. Been looking forward to paint him up, especially since I recently decided to collect and complete a few different Regiments of Renown. So far, I’ve got full sets of Harboth’s Archers, Knights of the Cleansing Flame and Mordini’s Nightmare Legion. Here’s another shot of Mordini with two of his cronies. Pretty rough sculpts by the Perry Twins, but they paint up nice and I’ve got a bunch of them on the boiler now, to use as regular skeleton warriors. Coming up next, two zombies. Managed to get them half done today, in just an hour or two of painting. Incredibly quick for me! One shieldswap later (and I’m not sure it’s for the better) here’s the full profile for Crazy Macy Sonnenshield. The model was sculpted by good ol’ Jes Goodwin and released in 1986, I believe. The first mention of it I’ve found is as Gnawa Batter in the 1986 Citadel Journal in the C01 Fighters range. 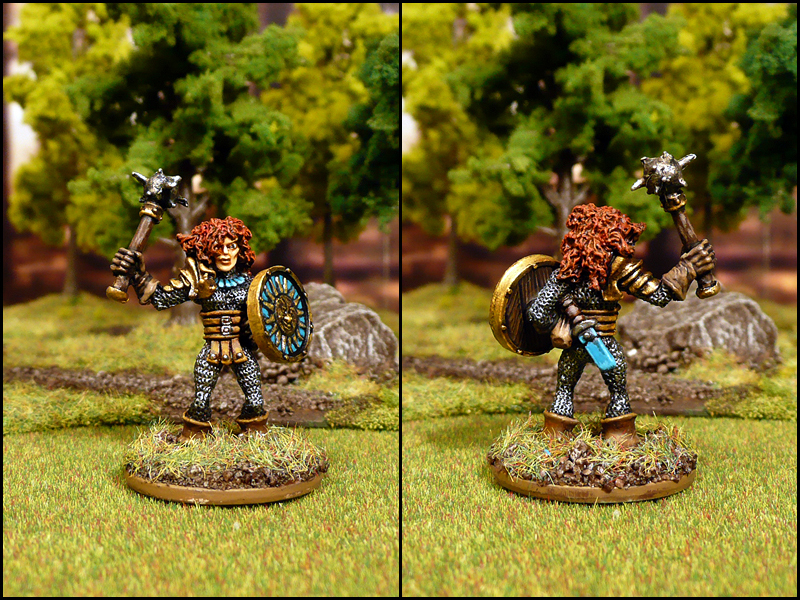 She’s named “Macelady” on the slotta tab, but was also available as Julia McEwman in the Tragedy of McDeath scenario pack. Lovely mini, but the straight legs give her a wonky posture and she’s quite a stiff jointed sculpt. I got the mini together with the previously posted ronin, from LeadAsbestos at LAF. Quality 3+, Combat 4. 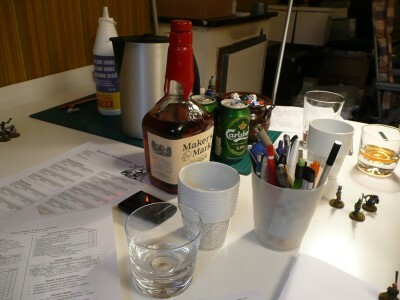 Berserk, Fearless, Capricious. Little is known of this beautiful but deranged female warrior. She’s as deadly as she’s foul mouthed and short tempered. While viewed with some apprehension and mistrust due to her erratic behaviour, the people of Stillburg have learned to accept her as an occassional resident at the Nag’s Head. “Oi! What’s this ‘capricious’ malarkey? !” I hear you say. Well, it’s a house rule trait of sorts. It’s a bit of a “Solar powered” rip-off, but instead of being either good or bad – it’s a bit of both which ever way the dice roll. I always intended her to be a bit of a loose cannon. She’s capable, but not reliable. After all, she suffered a quite severe blow to the head as a young lass. I even toyed with the idea to paint a white bang in the hair to illustrate that. Decided against it, as I managed to get the hair as I wanted on the first go. Here she is doing what she loves most – disposing of zombies. Let’s see when she’ll be joining the Stillburg heroes in their adventures. As a final little something I give you a WIP sneak peek of what’s coming up next.